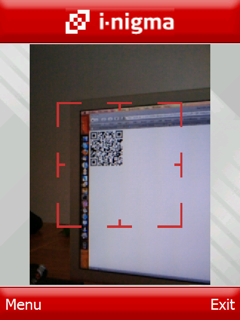 Download i-nigma barcode reader and discover the coolest way to get content on your camera enabled mobile device. With the i-nigma reader installed on your mobile, you�ll be ready to decode smartcodes and connect direct to the mobile internet. I-Nigma can now read QR codes, Data Matrix and 1D EAN13 barcodes ! 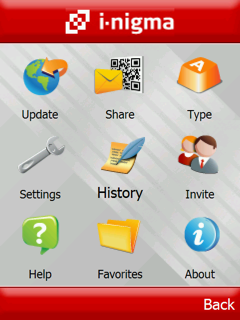 View sports clips, check out travel info, or get news you can use - just by scanning a smartcode with your camera-phone. point your camera over the sample barcode while running the i-nigma barcode reader application on your camera enabled Windows Mobile device !